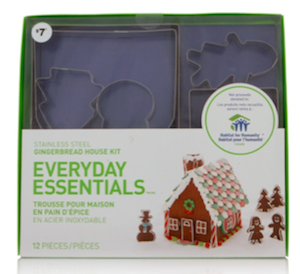 Loblaws proudly celebrates their three-year partnership in support of Habitat for Humanity Canada with the Everyday EssentialsTM Gingerbread House Kit, a new stainless steel 12 piece cookie cutter set specially designed for building and baking a gingerbread house. The Everyday Essentials™ brand was created to provide busy families with value-driven products to outfit the kitchen, the hub of every home. Retailing at $7, with net proceeds of $80,000.00 benefiting families across the country, this Habitat for Humanity Canada feature product is available in select Loblaw banner stores including Real Canadian Superstore now. The gingerbread house is not only a perfect tie in to Habitat for Humanity’s program goals and message, but it also allows families to share a special moment together building a gingerbread house and teaching their kids about giving back to those in need. The net proceeds of the Everyday EssentialsTM Gingerbread House Kit will be donated to Habitat for Humanity Canada to help support their national and regional programming. This year’s partnership focuses on delivering funding to Habitat for Humanity Canada’s 360 Build Smart Partnership, as granting programs managed by Habitat for Humanity Canada helps Habitat affiliates across Canada achieve the capacity they need to build homes in their communities for families in need. Every family deserves a safe, decent and affordable place to call home, and approximately 1.5 million Canadian families are currently in need of these basic necessities. By supporting Habitat for Humanity Canada we help give these families the hand up they need to build a better life and break the cycle of poverty. Founded in 1985, Habitat for Humanity Canada is a national, non-profit organization working towards a world where everyone has a safe and decent place to live. With the help of over 63,000 volunteers every year and 65 affiliate organizations from coast to coast, their mission is to mobilize volunteers and community partners in building affordable housing and promoting homeownership as a means to break the cycle of poverty in Canada and around the world. Please visit www.habitat.ca to learn more. Loblaw Companies Limited, a subsidiary of George Weston Limited, is Canada’s largest food retailer and a leading provider of drugstore, general merchandise and financial products and services. Loblaw is one of the largest private sector employers in Canada. With more than 1,000 corporate and franchised stores from coast to coast, Loblaw and its franchisees employ more than 134,000 full-time and part-time employees. Through its portfolio of store formats, Loblaw is committed to providing Canadians with a wide, growing and successful range of products and services to meet the everyday household demands of Canadian consumers. Loblaw is known for the quality, innovation and value of its food offering. It offers Canada’s strongest control (private) label program, including the unique President’s Choice®, no name® and Joe Fresh® brands. In addition, the Company makes available to consumers President’s Choice Financial® services and offers the PC® points and PC Plus™ loyalty program. Loblaw stores offer a growing portfolio of private label general merchandise brands designed by Joseph Mimran of Joseph Mimran & Associates, Creative Director Joe Fresh, Home and Entertainment for Loblaw Companies Limited. The President’s Choice® collection offers not only food, but great quality home products at very competitive prices. The collection of cookware, tabletop, small appliances and kitchen gadgets features the quality, value, style and innovation Canadians have come to expect from the President’s Choice brand. Simple packaging and value-driven price points make the Everyday EssentialsTM line perfect for those outfitting busy family kitchens, starter homes and campus dorms. The Life at Home® brand offers stylish home décor accessories and linens. Smart outdoor living and camping products are available under the TeraGearTM brand. The chicly-designed JogiTM fitness line has evolved from basic yoga and aerobics accessories to a full health and wellness collection. The J±TM brand offers well-designed and functional small electronics and stationery for school and home. Outfit furry friends with Cats + Dawgs pet décor and accessory items, And organization of kids’ rooms is made easy with the Jump Kids World TM line of children’s decor, furniture, accessories and toys.